Dr Greenthumb's Em-Dog by B-Real of Cypress Hill's parents are the renowned OG Kush and a Chem#4. This marijuana plant performs surprisingly well both indoors and outdoors in dry, warm, sunny, temperate and Mediterranean climates or in the greenhouse. 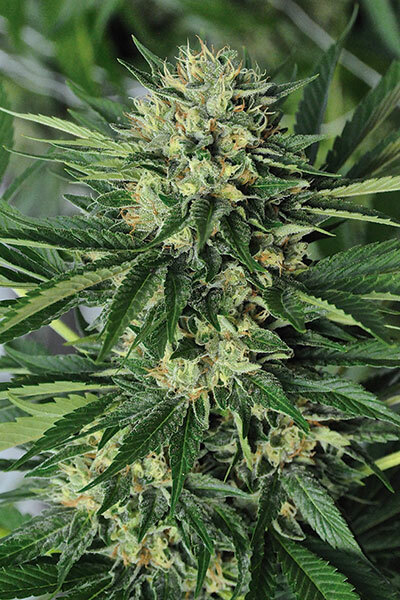 It is a cannabis plant that yields high amounts of thick, compact buds covered in a generous coat of resin. Indica lovers and cannabis experts alike will fall under its spell. The flavour and aroma of Dr Greenthumb's Em-Dog by B-Real of Cypress Hill are intense, with hints of tropical fruit, lemon, exotic wood, pine wood and oil. The powerful effect is quite balanced, slightly more physical than cerebral, guiding you into a prolonged state of relaxation. A cannabis strain with outstanding features. awesome results! thanks HSO great grow as always!! Hi all Em dog ,enormous plant ,amazing smell and beautiful color with shine silver trichoms. This queen 4 weeks grow and 75days bloom. In the first week bloom must use 2x vertimec 1,8 and kill spidermites. Bucket 45 ltr drip from the General Hydrophonic . Medium soil and fertizer from canna ,aqua series plus cal mag mills ,top max,bio heaven biobizz. Light 4xvero type c 200w wall power. Realy queen from growroom. Thanks wizards. Em-Dog is a interesting strain, it has a fairly nice balance as a hybrid strain, but does lean a little more on the indica side (70/30). This strain is a big producer, putting out really fat colas of extremely dense rock hard buds that are highly resinous. The aroma given from Em-Dog is reminiscent of diesel and citrusy piney tones. This one is a heavy hitter, a little goes a long way! Seriously monster buds for a plant with OG in its parentage. I have got these bean and WOW they are awesome!! My buds look like golf ball and them smell and trikes are great! The flavor and the high is so awesome I will definitely be running this girl again thanks HSO for creating such an awesome strain!! Having grown many strains, including some of the legends (jack herrer, la confidential , sssdh and various g13 cuts) i didnt think much of all this hype about the "em dog" but boy was i in for a surprise! not only is the strain easy to grow and manage but both the OG and Chem leaning phenos are both stellar. If you want the sweetest tasting pheno look for the thin viny one.. she will deliver all the mentioned flavors from HSO's own description. My favorite of all the strains I've grown from hso. Fat round kolas with gassy, wet dog (haha) overtones. She really loved her cal-mag during vegging. The high is incredible! It is recommended not for use in the daytime. The head/body high is perfect for a sleep aid. Hits the body heavy within 20mins. Next round will be using a trellis for support. The nugs were so heavy it had a hard time supporting herself. Be prepared to have your whole house reeking of green sticky goodness. Em-Dog comes from one of my favorite breeders within the HSO crew Kief Sweat. Kief Sweat puts out incredible genetics, this is my favorite of his creations. She throws off big mama fan leaves that need to be tended to in the later half of flowering and she produces some real gassy, chem and OG terps. I truly enjoyed smoking this plant just as much as I enjoyed growing it. Make sure to give her enough nutes because she loves drinking and she can definitely handle it. My seeds arrived super fast. No delay. These babies germinated fast and with vigor. Within 48 hours of popping, these babies started showing their first set of true leaves. I am impressed with her vigor and growth rate. I will grow in coco coir and smart pots. Great so far and can't wait to see her explode in flower! Very beautyful Plant ! Nice in Veg. Big Indica Leafs ! Flipped her today to 12/12 . Can't wait to see her in Flowermode. Next Update soon ! Grows extremely well outdoors in usa maine huge long dense colas smell like an orange pell taste like lemon or berry will be growing again also have it growing indoors as well both I am very satisfied with wish I could do sum pics! Growing her now! Loving the indica style leaves. Giving off a tropical yet musky smell from it. Love the fact all your genetics are stable. Dr Greenthumbs Em-Dog is a must have in your garden & collection. A classic cross of OG Kush & Chem#4 is a wonderful strain for any Indica dominant lover out there. Fulll of yummy trichomes,perfect for greenhouse growing does well in tropical weather. Had a wonderful experience with this strain, I recommend it.